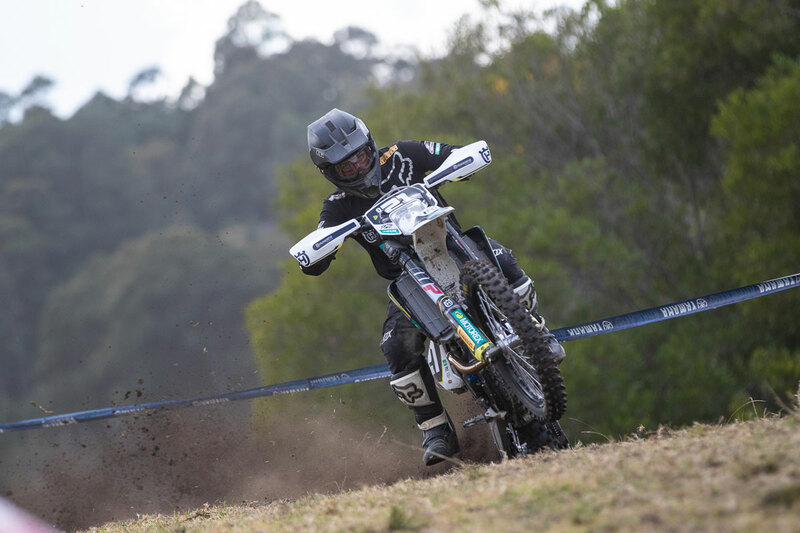 Three round wins and a brace of podium results marked a strong weekend for Husqvarna Enduro Racing Team at the Dungog round of the 2018 Australian Off-Road Championship (AORC) in New South Wales. Victorian standout Daniel Sanders topped the E2 category on both days of competition in dry, dusty conditions, overcoming minor injuries sustained in a state event last weekend to extend his championship lead aboard the Husqvarna FE 450. He was also second outright on Saturday and Sunday. Those results were enough for Sanders to maintain his unbeaten tally in the championship following this weekend’s Enduro format event, stretching his lead to 22 points as the series enters its second half. He is also currently ranked second in the outright points. It was a breakthrough ride for E1 rookie Fraser Higlett as he captured his first-career victory in the class on Saturday, starring aboard the Husqvarna FE 250. The Queenslander impressed by setting the fourth-fastest pace overall, then going on to claim second in class on Sunday and climb to P2 in the point-standings. E3 contender Lachlan Stanford also enjoyed a convincing weekend, taking second in class at the conclusion of both days. Powering his Husqvarna FE 501 to a pair of podium results and gaining strength as the weekend progressed, Stanford continues to sit second in the E3 rankings overall. The AORC series will resume with round seven of the championship at Broken Hill, New South Wales, to be held on 1-2 September.